This project status remains at urgent status (i.e., Yellow). For AD this effort remains on hold until the non-technical aspects of the project have been resolved. For META, progress has resumed. The team continues efforts to resolve duplicate user accounts. KUL is also targeting early July for release of the 'doesUserExist' web-service, and associated clients. This web-service will prevent duplicated accounts from being created in the respective systems. All organizations must have implemented this web-service into their user-account provisioning processes before all of the duplicate accounts can be resolved. The Increase MFD Usage team has completed standard operating procedures for optimizing MFD usage across campus, and is now implementing these processes in lockstep with the Reorganize and Redefine IT Staff and organization team. A PaperCut upgrade is planned to leverage additional functionality of Konica Minolta MFDs using Embedded PaperCut. Work has begun on MFD Findings Document. There was a 12.1% decrease in MFD usage for the month of May 2014 versus May 2013, making our YTD increase 12.3% over 2013. KU IT continues to work to implement server hosting plans and Managed Services Agreements (MSAs) for departmental server hosting and help communicate to departments the reasoning behind the server registration and centralization policy, http://policy.ku.edu/IT/server-registration-centralization. The Department of Student Housing signed off on their IT Staff Proposal and KU IT will continue to review the IT Staff Centralization Proposals with the School of Architecture and the School of Journalism. The project team consisting of staff from KU Lawrence, KUMC, and Wichita have compiled documentation with details on wireless configurations and monitoring solutions at their respective locations. This documentation, along with incident management processes, has been distributed to the project team for review and discussion on any potential areas of similarity. An online conference has been scheduled for the team to jointly review these configurations and solutions, and plan for next steps. We are moving forward with driving students to the updated portal as an entry point to CRM. A prioritized list of features has been approved by leadership and a sub-set of features to be completed in FY14 have been identified. Development work is in progress on the prioritized FY14 features. Planning for FY15 features is in progress. 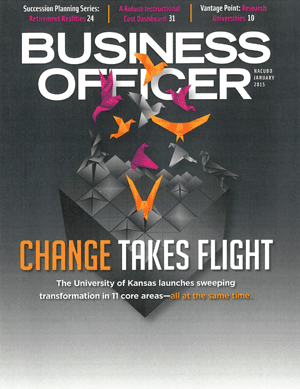 Changing for Excellence was the featured cover story in the January, 2015 edition of Business Officer, the official magazine of the National Association of College and University Business Officers (NACUBO). You can read the full story online.